Sign up for Action Alerts and Citizens Project News - Receive emails from Citizens Project to stay up to date on community events and learn about ways you can take action to further Citizens Project's mission. Sign up here. Report Incidents - Do you see religious bias in your childrens' schools? Have you been the target of discrimination? Do you see hate literature in the community? We cannot work to end these incidents unless we know when they occur and act. Report incidents here. Volunteer – Volunteers are crucial in accomplishing the Citizens Project mission of promoting diversity, equality and the separation of church and state. As a small organization with two part-time staff, Citizens Project relies on volunteers for much of the organization’s work. 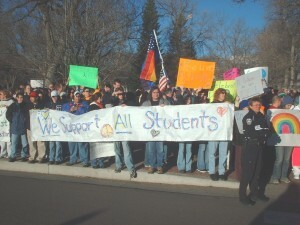 Citizens Project volunteers can have a great impact on the Colorado Springs community. If you are interested in making a difference with Citizens Project please contact us. Or, fill out a volunteer information sheet and email it to us. Donate – Citizens Project relies heavily on the support of individuals and families. Click here to make a donation to Citizens Project, or call the Citizens Project office at (719) 520-9899 to make a recurring donation. We appreciate your support!